[L]ess than one hour’s drive north from Amman is the city of Jerash, which is generally recognised as one of the best-preserved Roman provincial towns in the world. 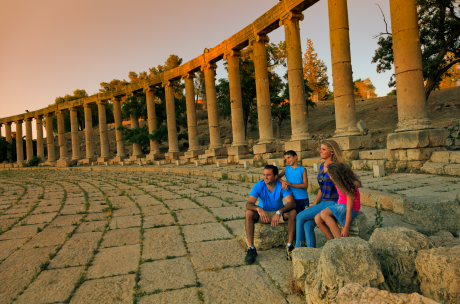 Even though there has always been human activity, Jerash’s Golden Age arrived with Roman rule. Jerash was a member of the Decapolis and played an important role in this commercial league. When Emperor Hadrian visited the city in 129 AD, a huge building programme was launched. Thanks to skilled engineers who built this city, the 600 metre long “Street of Columns” is as magnificent as ever. [I]t is easy to imagine the wealth of this city and its people when you are walking in Jerash. Every summer, the dramatic surroundings of the ruins host the Jerash Festival, featuring folklore dances, concerts, plays, poetry competitions and other international and regional activities. The modern city of Jerash can be found to the east of the ruins and whilst the old and new share a city wall, careful preservation and planning has seen the city itself develop well away from the ruins so there is no encroachment on the sites of old.